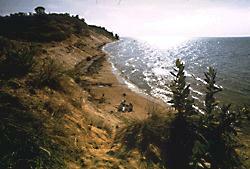 The Lakeshore is on Lake Michigan in the northern part of the state. The Visitor Center is in the Porter County Tourism Building located on Munson Road, just off Highway 49 and 1/2 mile south of US 20. Access to the Lakeshore is available from Highways 12, 20, 94, 49, I-80 and I-90. Dunes rise 180 feet above Lake Michigan's southern shore with beaches, bogs, marshes, swamps, and prairie remnants and other natural features. Historic sites include an 1822 homestead and 1900 family farm. The Paul H. Douglas Center for Environmental Education is in the west unit. Open year round. Some facilities are closed in the winter. Peak visitor month is June. Winters are cold and snowy, 0 to 35 degrees F; Summers are hot, 75 to 90 degrees F.
Visitor Center; museum/exhibits; NPS guided tours; self-guiding tours/trails; picnic areas; hiking; horseback riding; swimming; bathhouse; fishing; bicycle trail; cross- country ski trail. 25 miles of Lake Michigan shoreline between Gary and Michigan City. Camping facilities are available at Dunewood Campground (just south of US 12 via Broadway) in the National Park, at nearby Indiana Dunes State Park, or at private campgrounds. Reservations are not accepted at Dunewood Campground in Indiana Dunes National Lakeshore ($15/night, credit or debit card only), but they are accepted for campsites at Indiana Dunes State Park during the summer season. Dunewood Campground (no electric hookups) is open from the last Friday in April through the third Sunday in October. Food, supplies, and overnight accommodations are available in the surrounding communities. Let's head for the beach! You'll love the sights and sounds of the miles and miles of shoreline along Lake Michigan. The sand dunes will astound you, as will the vast variety of desert plants, giant wood ferns and white pines. Marine Center of Indiana can handle all your boating needs!